Today, LUMIFLON announced the release of its powerful mobile site. Darden stressed that while mobile sites are not common industry-wide, LUMIFLON recognized the usefulness of accessing vital product information from a phone or tablet. 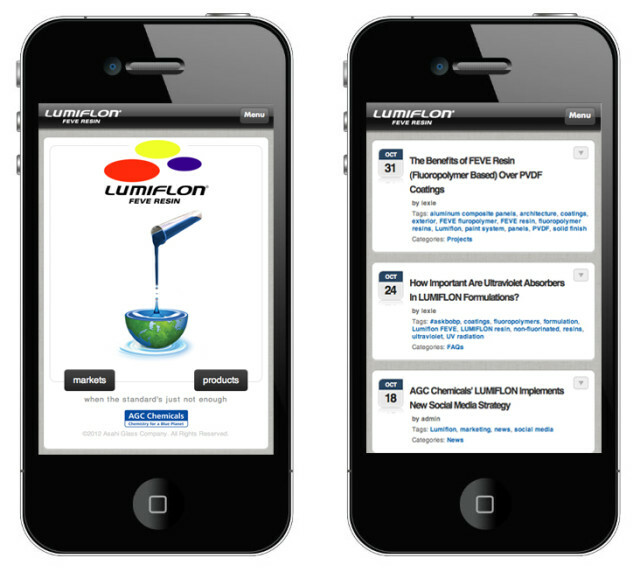 He explained, “LUMIFLON’s mobile site enables critical information to move seamlessly from the office to the field- enhancing efficacy at every level.” The mobile site is expected to set the standard for industry-wide mobile improvements. Our mobile site was developed using a user-centered approach. The result is a mobile site that provides the most sought-after information various user groups need. Customers can quickly review company information, products, markets, and downloads. Other mobile features include easy access to the company’s social media outlets- including LUMIFLON’s latest newsfeed, Twitter, and LinkedIn. LUMIFLON, a product of Asahi Glass Company, is a solvent-soluble fluoropolymer that offers distinct advantages for architectural structures, aircraft and automobiles worldwide.